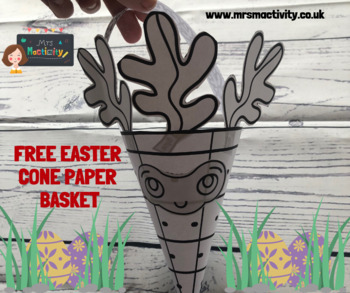 Get your hands on your very own Free Easter Cone Paper Basket this Easter! Super easy Easter craft anyone can do, and makes the perfect Easter Basket craft. Super simple Easter Basket that anyone can do. Use this free Easter Basket template to make the perfect Easter Basket for your Easter egg hunt. If you like this – you’ll love our whole collection of Easter Cone Paper Baskets in 7 designs – colour and black/white so 14 in total.